You got a message on your screen that your iPhone storage is full. Quickly, you deleted some photos and videos in your photo library to free up space. However, the information on your iPhone storage is still showing the iPhone storage is full despite having deleted some photos and videos. Anyone who has experienced this would agree it is very annoying. How then can you fix iPhone storage full after deleting photos? 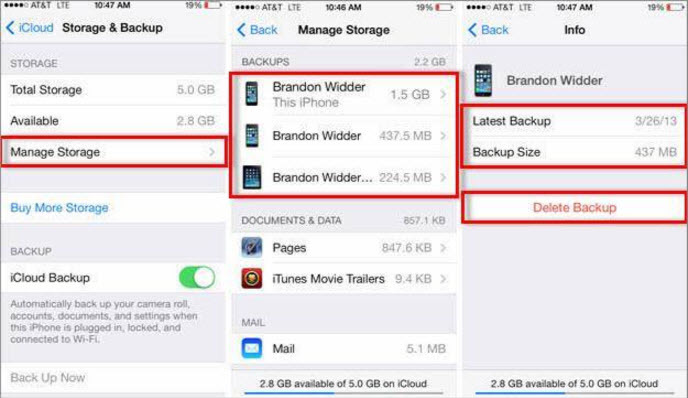 How to Fix iPhone Storage Full after Deleting Photos? There are some remedies that you can use to solve this problem. Step 1: Open iPhone settings app. Step 2: Tap General, then Storage & iCloud Usage. Step 3: Click on Manage Storage. Step 4: Click on any old files that are still backed up in your iCloud account and delete the backup from the pop-up menu. 2 Delete "Recently Deleted Album"
If you want to use this method, just follow the steps below. Step 1: Bring out the Photos app, and tap on Albums which is usually at the bottom of the screen. Step 2: Click on Recently Deleted from the album list. Step 3: Click on "Select" in the upper right corner of your iPhone screen. Step 4: Click Delete All at the bottom. Step 5: Confirm the deletion. 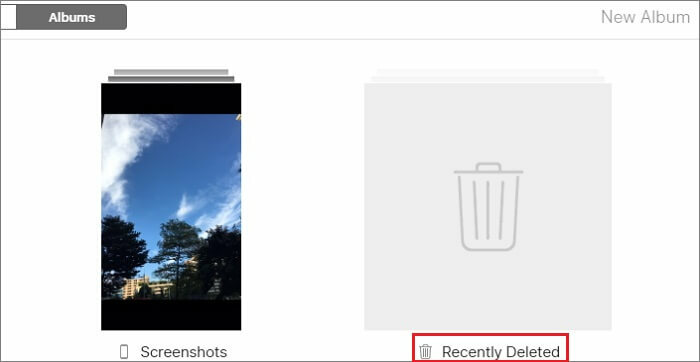 Another wise method to get rid of “Recently Deleted Album” is to use a powerful software like iMyFone Umate Pro, as the photos deleted by Umate pro won’t go to Recently Deleted Album. iMyFone Umate Pro or iMyFone Umate Pro for Mac can delete several photos at once, making it easy to create space that your iPhone needs to function properly. The stand feature of Umate Pro is its ability to delete permanently. Permanent deletion helps to protect privacy and free up your iPhone. No recovery tool can bring back all that have been erased by Umate Pro. But the photos that you have deleted in normal ways can be recovered easily by tools. Step 1: Start by downloading and installing Umate Pro to your computer. Step 2: Connect your device to the computer system with a cable. Step 3: From different erase modes of Umate Pro, select one that matches your need. 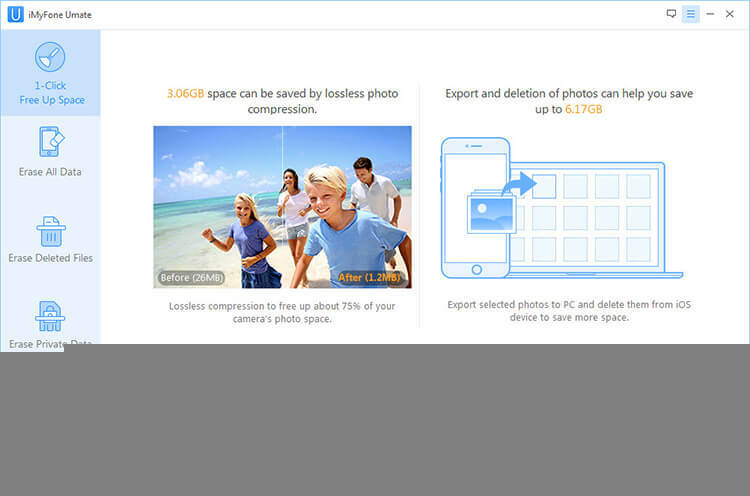 • Choose the “Erase Private Data” mode to erase current iPhone photos. Step 4: After the scan, you can preview the photos and select the ones to erase. Step 5: Click on "Erase Now" to erase iPhone photos. What Other Things can Umate Pro Do? Umate Pro can help clear junks and temporary files, therefore, clean up iTunes "other" storage. Photo Compression is another thing that Umate Pro can do to free up iPhone space and create room for other incoming photos. 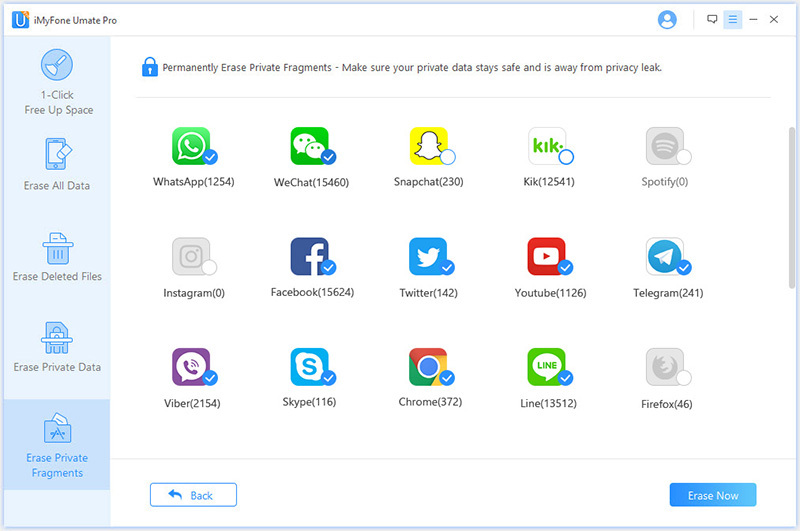 For privacy protection, you can use Umate Pro to permanently erase iPhone messages, call history, files, App data (WhatsApp, WeChat, Snapchat, Viber, Kik …) etc.